A map of the Chestnut Hill Campus. Click for a larger image in PDF form. A google map of the location of McGuinn Hall on the Boston College Campus. Our lab is located in the lower level of McGuinn Hall in room B22 on Boston College’s Chestnut Hill Campus. Feel free to call 617-552-1446 or Email BCLearningLab@gmail.com should you have any questions. Take Interstate 95 (Route 128) to Exit 24 (Route 30). Proceed east on Route 30, also known as Commonwealth Avenue, for 4.2 miles until you reach Centre Street. Make a right on Centre St. Drive south on Centre for 0.4 miles and then make a left on Beacon Street. Boston College is 1 mile up on your left hand side, beginning at the corner of Tudor and Beacon. Stay on Beacon for 0.4 more miles (driving along the south end of campus). McGuinn Hall is located at the 2nd entrance to campus (across from the Lynch School of Education. The lab is located in the lower level of McGuinn Hall in room B22. You can enter through the side entrance to the right of the main entrance by a black fence (look for sign for the “Thinking and Learning Lab”). Walk downstairs and the lab is immediately on the right. On the day of your appointment, please call the lab at 617-552-1791, if you are running late or having difficulty finding the lab. Take the Massachusetts Turnpike (Route 90) to Exit 17. At the first set of lights after the exit ramp, take a right onto Centre Street. Follow Centre Street for 1.9 miles south (to the 5th set of traffic lights) until Beacon St. Make a left on Beacon Street. Boston College is 1 mile up on your left hand side, beginning at the corner of Tudor and Beacon. Stay on Beacon for 0.4 more miles (driving along the south end of campus). McGuinn Hall is located at the 2nd entrance to campus (across from the Lynch School of Education). Parking is available on Beacon Street, some of the side streets, and Boston College’s Beacon street garage. Take the Massachusetts Turnpike (Route 90) to Exit 17. Take a left over the bridge after passing the Crowne Plaza Hotel. Take the first right onto Centre Street. Follow Centre Street for 1.9 miles south (to the 5th set of traffic lights) until Beacon St. Make a left on Beacon Street. Boston College is 1 mile up on your left hand side, beginning at the corner of Tudor and Beacon. Stay on Beacon for 0.4 more miles (driving along the south end of campus). McGuinn Hall is located at the 2nd entrance to campus (across from the Lynch School of Education). The Boston College branch of the MBTA’s “Green Line” (B) ends at the Boston-Newton boundary on Commonwealth Avenue. 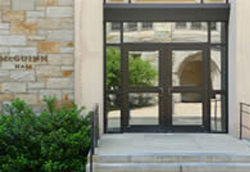 Cross the street and walk by St. Ignatius Church and follow the perimeter road around to campus entrances. If walking follow campus maps to McGuinn Hall. The lab is located in the lower level of McGuinn Hall in room B22. Alternatively, you can take the “Green Line” (D) train to the Chestnut Hill stop. Walk north up Hammond Street about 15 minutes. Then take a left on Beacon Street. Enter the 2nd entrance to campus on your left (near the Lynch School of Education Building). McGuinn Hall will be on your left. The lab is located in the lower level of McGuinn Hall in room B22.